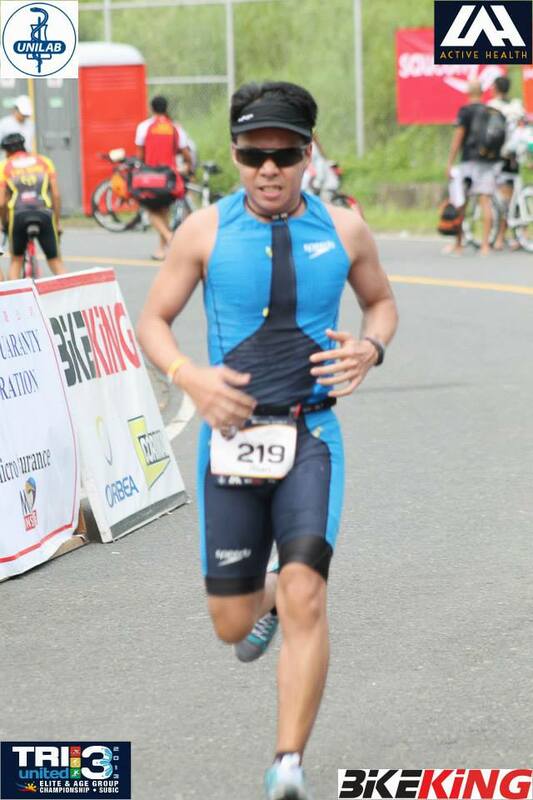 It all started after reading an article from Pinoy Fitness about Sense of Accomplishment in finishing a Triathlon. The story somehow inspired me and swore that one day; I will also feel the same sensation that the author of the article felt when crossing the finish line. I commented on the said article then the long process of preparation began for me. The journey that I went through to accomplish this was not all about training physically alone, but it included all aspects such as mental and financial. Just like any other aspiring triathlete, the most difficult for me was the swimming discipline. I started training my swimming skills the weekend after I read the article. I was initially confident that I could easily swim at least 200 meters (4 laps of Olympic Distance pool) but I was wrong. I wasn’t even able to swim the whole 50 meters using the front crawl. I knew then that there was something wrong with my stroke that I need to correct first. And then, I started to do a research, study and watch some best practices online, etc. just to correct my form. I know it is not what you can call training smart but I was trying to learn the proper way by myself. After training, searching, reading, watching for several weeks, I still couldn’t properly do the freestyle stroke. I was losing hope when I decided that it might just not the right stroke for me so I tried swimming breaststroke. I tried watching other swimmers who were doing laps using breaststroke and watched them underwater. One thing that I noticed from their style was they were spending more time underwater. I realized that they were gliding. I tried their style and tried gliding as long as I can in streamline position whenever I’m underwater. This technique helped me to conserve my stamina and thus I was able to make my first 1.5km swim in the pool non-stop but it was very slow. It took me about 1 hour to finish the distance. But then again, this gave me hope, at least there is a stroke that I know I can use to make the 1.5km distance, I will just practice some more to eventually develop the technique. I disciplined myself that I need to do at least one discipline every week. If not swimming, I normally run in the office (treadmill) before going home. I run 5km initially and then 10KM eventually. Sometimes, I would go to Mall of Asia to do bike laps there, but I was not so exited in biking because I was using mountain bike back then. 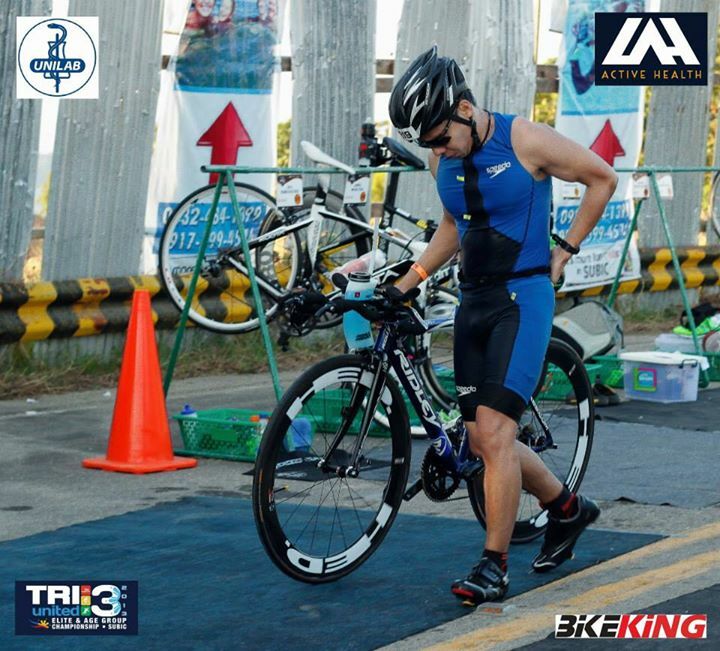 After several weeks and months of training doing the same swimming, bike and run routine, I got tired and told myself, I can never (or wont) join the triathlon if I do not have a tri-bike. I needed some sort of motivation, I know that there are other organizers who would allow the use MTB but then again, I would join only if I have my own tri-bike but I know that tri-bikes are a bit expensive. Come October 2012, I decided to sell my MTB and started saving money in preparation for the tri-bike that I’m planning to assemble by December after I get my 13th month pay. But sad to say, the money from my sold MTB and 13th month pay never materialized to become a tri-bike. Instead, I bought some other luxurious items like a cell phone and watch and spent the other savings to some out of town trips. Months past, and the year 2013 was already on its third quarter and the possibility of having my bike was still impossible due financial concerns. I was desperate and losing hope whether or not I would still be able to assemble my bike on time. I was also losing interest in continuing training for lack of motivation. The one discipline per week that I promised most of the time was not happening. I always had reasons on why I won’t do any of the routine on a weekly basis. I’m about to accept the fact that it wasn’t for me until something came up that provided me opportunity to complete my bike. It reminded me of some article that I read in the past. Have you ever noticed in life that things can look really bleak just before a dramatic turn for the better? The businessman reports that just before he made his fortune, he was about to quit. Perhaps you have had the experience. Life is like that because there is a principle at work here – the ‘eleventh hour’ principle. it is always darkest and coldest just before the dawn. But if we hang on long enough, we will get our rewards. – Eleventh Hour Principle. To make my story short, I was able to complete the assembly through the help of my brother, he lend me some money to complete my tri-bike. It motivated me to continue training. 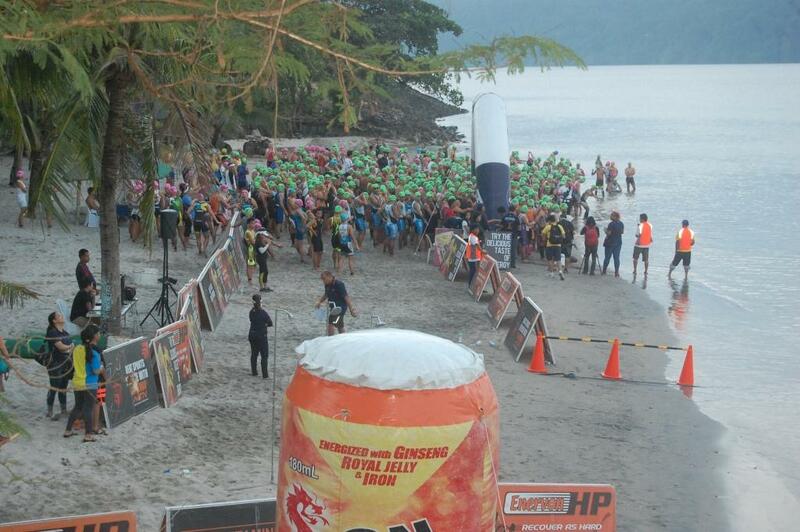 And then, I decided that it is now or never… I registered in the Tri United 3 Elite & Age Group Championship in Subic. For me, it started on early Saturday when I was preparing and packing up everything that I will bring to the race. I hardly had 2 hours of sleep on Friday night because of that preparation. We hired someone that would drive us to Subic to avoid additional stress. While travelling, we noticed a lot of vehicles carrying tri-bikes or road bikes. 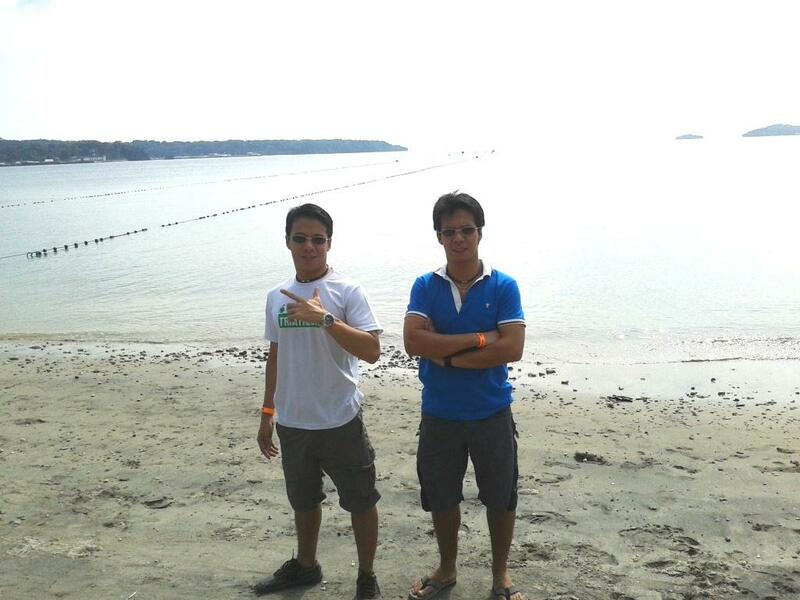 We guess they were also travelling to Subic to compete for the same event tomorrow. I felt nervous and at the same time exited. Finally, we reached the convention and there we saw the other competitors and athletes with their expensive bikes. As a newbie, it actually felt intimidating, but then again, I remembered suddenly my old saying – “Have pride in what you are, excel in what you do, you are somebody”… I tried enjoying the scene and moments later, I was already proud that I’m actually one of them and I was also there to pick up the race kit just like everybody else. After going to the convention, we immediately went to see the actual beach where the competition will be held and to become familiar with the location. We saw some athletes visiting the site as well, there were also others who brought their bikes and started navigating the bike route, and I thought that probably they were elites simulating the race already. We went back to the hotel to have our early dinner and rest early at about 7pm. Because of too much excitement, I wasn’t able to sleep the entire night. On October 27, 2013, armed with borrowed tri-suit; old running shoes; newly assembled bike; leap of faith; some energy gels; training experience; courage; determination; my twin brother alongside with me who was also participating in the race (who had been instrumental and inspired me to join triathlon and did I mention that he was the author of the article that I read a year ago?) and finally, I won’t forget the final words (good luck) and the gesture (fist bump) of motivation that my brother gave to me during the final countdown before the start of the swim leg – I told myself that this is it and I won’t give up no matter what! After gun start, we started running towards the open water to swim hard. I know there were faster swimmers than I am but it didn’t bother me, I was determined to do only the pacing that I trained for and comfortable doing. I was just a little cautious for the other swimmers since we were bumping with each other during about the first 300 meters. After the swim, I immediately run to the transition area, but while running on the ramp, I felt losing my balance and hit the handle of the ramp with my hips. I guess that was because my legs were still tired from the swim and my body was still adjusting that I’m no longer swimming. But I managed to continue and prepared myself for the bike leg which was my favorite part. Upon reaching transition, my brother was about to leave the area with his bike. While biking, I tried maintaining at least 30kph only as I’m a little bit conserving my energy for the run leg. Also, I’m still not so comfortable doing the aero position so the wind resistance was preventing me to move faster. Every time I would see my brother on the other side of the road, I would normally ask him whether the U-turn is near or not. He would always reply yes to me. I enjoyed the scenery while biking and I kept reminding myself that I’ve done this in training and that every time I see the distance from my speedometer getting nearer and nearer to 40km, I always rejoiced and shouted that “I’m almost there”! 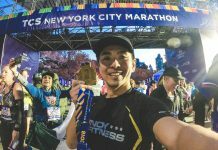 During the last leg of the race, I started at about an average running speed only to adjust my balance first from biking to running when I noticed that I forgot to bring any energy gel for the run leg. I just convinced myself that I may not need it anymore so I just kept on running. And again, I would see my brother on the other side of the road and I would normally ask him if the U-Turn was up ahead. And again, the answer was always yes. But even though how hard I tried, I was not able to catch up with my brother during the swim, bike and run. On the final 2.5km run after the last U-turn slot, I started counting all male athletes that I would see on the other side of the road and all those athletes that I overtook. It motivated me to push myself even harder for the last time. And then finally, I saw the finish line. I ran as fast as I can. I reached the finished line after 3 hours and 29 minutes after gun start. I saw my twin brother in the transition area and he was ahead of me by 3 minutes which for me is not bad at all considering this is my first Olympic Distance Triathlon. The preparation for the much awaited finish line crossing that would take couple of seconds only was more than one year in the making but the fulfillment and accomplishment that I felt was enormous. Want us to share your Story?? Submit it – Click -> Share Your Story! Next articleRunning with the Saucony Kinvara 4! I am just starting to learn how to swim this quarter and 1st quarter of next year biking. WOW!! such an inspiration to all… good luck for your forthcoming Ironman 70.3! I like this story, a lot better than the one I posted. 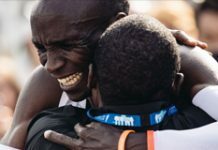 Not that I was mentioned in this story but I was touched by how the author explains clearly his feelings and emotions about this race, his preparations in making it possible and the few life’s principles he shared. This reminds me of the farewell letter that the author submitted in the company that we both worked for in the past. Couple of our female officemates cried while reading the farewell letter because they were really touched by the letter. This makes me think he maybe has a talent in making stories like this that captures feelings. For me, we could finish several races but there will be one particular race that will always be our favorite and I will not be surprised if this will be his most proud race for a long time to come. Good luck to your training and good job to your story. I guess other newbie triathlete will be inspired and will see them writing their own story as well here in PinoyFiness. I am looking forward to race with you again. Ooops, I missed this comment out :). Thanks Jay, everybody starts on something, and even those pro were once a newbie. But I bet you’re no longer a newbie after more than 3 months already. Hope to see you as well on the road and who knows, our paths might cross someday! Very moving story… Very Inspiring…thumbs up, Fusingan brothers!! Hi Nan, thank you for reading my story and for being the first one to put a comment in it. Good luck to your goal training and I believe you can do it as well and may even greater than what I and my brother have done. I believe one year of consistent training is more than enough for you to complete the standard distance triathlon. Based from my experience, I felt that I’m ready to take the Olympic Distance challenge after I was able to complete at least 2km – (swimming in the pool non-stop) and after I was able to do at least the bike (40km) and run (10km) combo simultaneously in one training. The only difference I felt when swimming in the open water was it was a little bit more tiring as you would have to fight the current and swim against many swimmers all at the same time. I also felt dehydrated more after swimming in the open water which was also challenging for me since I felt very thirsty while swimming during the race. Hope to read your very own story soon! 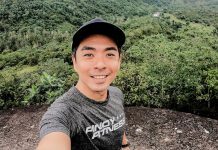 Hope seeing you in one of your trainings (possibly in All of Asia – MOA – where I do my bike and run or in Makati Aquatic Sports Arena -MASA where I train my swimming) and possibly in one of the races someday. Hi BughawnaBuhangin, I’m happy that you consider my story as an inspiration as the story of my brother became mine. Thank you for your wishes and I totally agree with you that self-trust is very important in achieving any goals. Triathlon now has started to become part of my life, I will surely continue to keep swimming, biking and running to improve some more and to be my own personal record. To my brother – everything was just the aftermath of what you did more than a year ago. There is always a sequence of events, I remember reading that from a book that you asked me to read long time ago (Simply Brilliant). ‘The earth is moved and rotated from its position by the weight of a tiny bird resting upon it’…I would have not done all of this and I may have been in another path and may have set a different goal if you have not bravely attempted something (joining your first triathlon ever) that was unknown to us before and seemed impossible for us in the first place. I’m just following your footsteps; you were always the one who sets the tempo even when we were kids, when we were teenagers and even until now. The credit is all yours; I’m honored to have competed with you again this time around. Thank you for the support and I’m also aiming to put on the next chapter of the story with you once again next year!!! Thank you Pette (officemate), hope I was able to convince you already to step off from your bike for now and start swimming. We’ve been to many adventures already climbing mountains, Biking, Singapore race, etc. 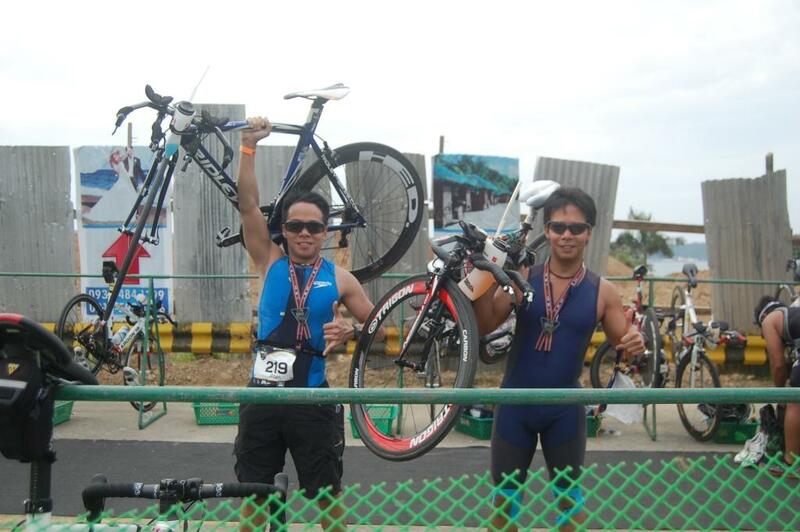 And hoping you would join me in another triathlon experience by next year. I was so teary eyed with your story . Im now on my 6th month of training in swimming. Always asking myself if i can really do it.. I m so inspired with your effort hope i could meet you for some tips ..
Hi Alma, I’m flattered by your comment. I’m not an expert but anything I can do to help, please send email to allan.s.fusingan@fisglobal.com. Nice story. Very inspiring. Congratulations!